our kitchen: back together again . . .
Here’s a photo of our kitchen, taken this afternoon after days of disruption due to construction of our new soapstone countertop. The Grohe faucet was installed last night and our plumber recommended we replace our old Insinkerator with a new one which I purchased at Home Depot around 8 p.m. while he was still here. a Grohe faucet in brushed nickel finish . . . This morning, I washed all the soffit pottery (old and new) that I’ve collected over thirty years. The huge New England wooden bowls went back up on the top shelf where they have watched over us for as long as we have been together (>21 years!) One of the bowls was the first thing I ever bought at auction for fifteen dollars when I first moved to New England and became an antique dealer. I’ve sold many collections since that time, not needing to hold on to them as such, but keeping one or two things–okay, maybe three or four (redware) that are my favorites. Actually, I enjoy having a few things that I absolutely love than collections of things. Like this old carved, bleached out breadboard. 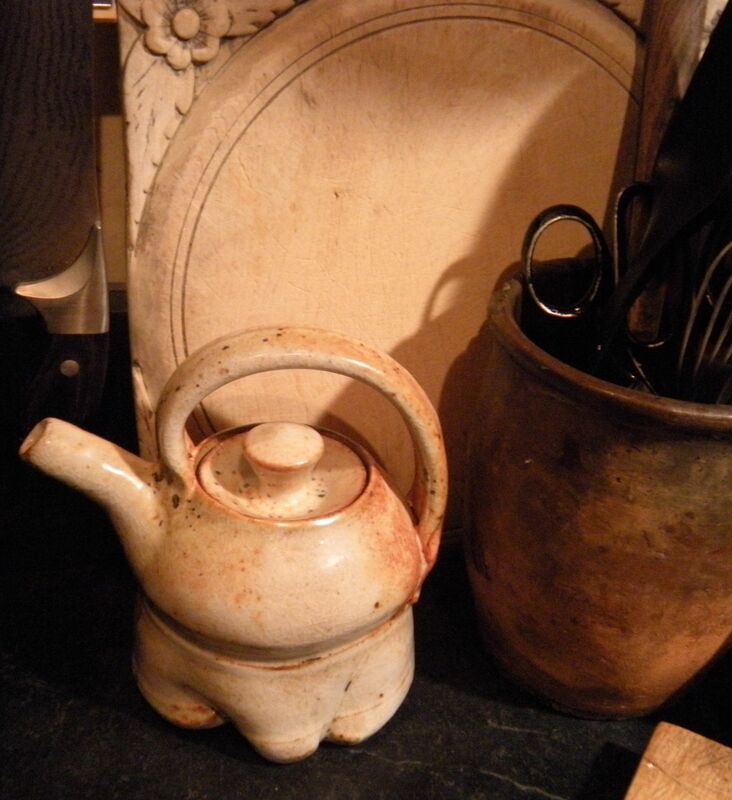 shino teapot with carved breadboard and redware. 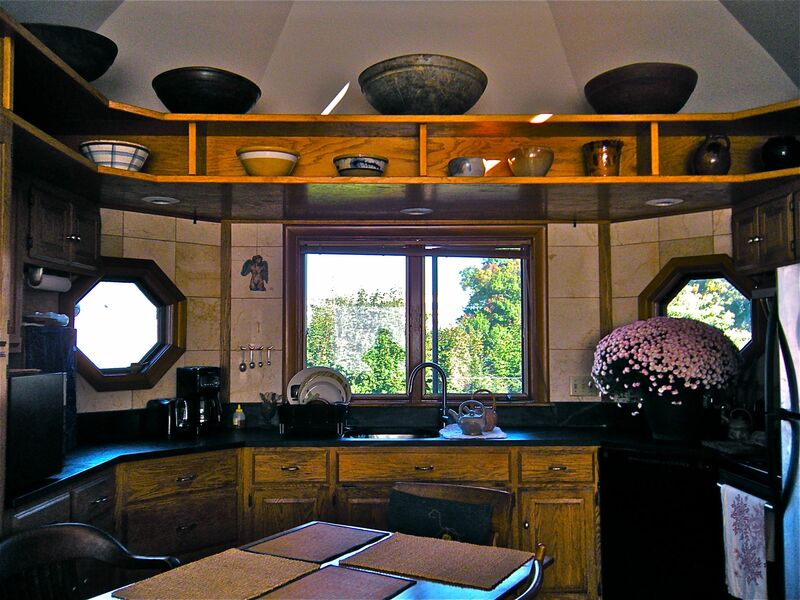 . .
A real bonus: positive energy flowing from a gorgeous soapstone countertop. What else could we ask for? We give thanks to all the Helpers to find the sink and faucet we liked the most at the very last minute; for the soapstone workers who were truly nice people and who cared about their work, selecting the flow of the contrast grain so that the countertop has a natural energy flow rather than merely static wisps of pattern in the rock. It’s all come together with a lot of effort on everyone’s part. Thanks also to my husband, G. who diligently aided and supported the workmen during the project. I still have so many projects in my head to prioritize and reorganize kitchenware, drawers and the pantry. I like doing it though, even if It takes me awhile. It doesn’t feel like work, especially in light of this wonderful group undertaking that has transformed our home. It is beautifully together! I hope you enjoy many years of more great cooking and eating in the new kitchen–and the faucet is perfect. Thanks so much for the compliments! We like the faucet too although we thought we were getting a high polish chrome when we opened the box (more horseplay by the Kitchen Gods~!) The new kitchen has inspired me to look into poaching salmon in a large French poacher (an eBay bargain) for the holidays! Wonder where I’ll put it when it’s not being used? Your project has turned out perfectly! What a beautiful work space to enjoy cooking in! Hi Beth, thanks for your nice comment! 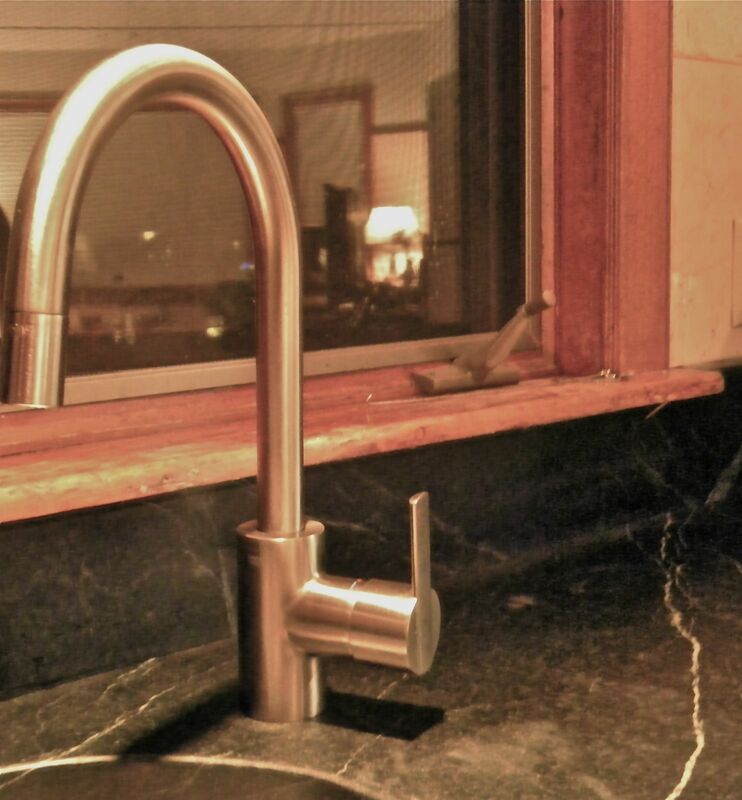 We love how it all turned out, especially the stone which we selected and the perfect sink and faucet that appeared out of nowhere at the last minute! I’m now thinking about learning how to poach fish in a large vintage French fish poacher I found on eBay! Sounds like poached salmon for Christmas Eve this year might be a real possibility! such a beautiful kitchen Katherine! perfect for all the cooking adventures!